Location: Zibo is in the center of Shandong Province, neighboring Mt. Taishan in the south and backing the Yellow River in the north. It is also bordered by hot coastal tourist cities, Qingdao, Yantai and Weihai in the east, and the capital city of the province, Jinan, is just seated to its west. 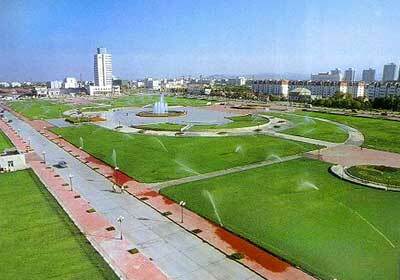 The city is a vital communication hub of Shandong. History: Zibo was the capital city of Qi Kingdom, one of the five powers in the Spring and Autumn Period (770BC-476BC). Cuju, a game regarded as the origin of ancient football, has risen since then, and Zibo is titled to be the birthplace of football by the FIFA. Zibo, as the name of the city, began in the early 1920s for the exploitation of coal mines in Zichuan and Boshan. Physical Features: Zibo is located in the transition zone between mountainous area in central Shangdong and North China Plain. Its southern area is occupies by medium and low mountains, and hilly area is mainly distributed in the center, while the northern part of the city's territory is plain area. Climatic Features: Lies in the warm temperate zone, bearing a semi-humid and semi-dry continental climate. January and July are respectively the coldest and hottest month during a year. Like major cities in North China, Zibo has four distinct season with an annual average temperature of 12-13C (53.6-55.4F). Yuanshan National Forest Park: Located southwest of the Boshan District, it is the only national level forest park in Zibo consisting of five scenic zones. The great Wall of the Qi Kingdom, grass skiing field, Dinosaur Valley and folk custom garden are all the attractions of the park. However, as a time-honored cultural city, Zibo is much richer.